First oil is expected in 2025 from the Bay du Nord project. Newfoundland and Labrador and Equinor Canada have announced an agreement to develop the Bay du Nord oil project — the first remote, deepwater project in the province's offshore. The province is buying 10 per cent of the total $6.8-billion project. Overall, the project is expected to bring in $3.5 billion in total provincial government revenues over its lifetime. 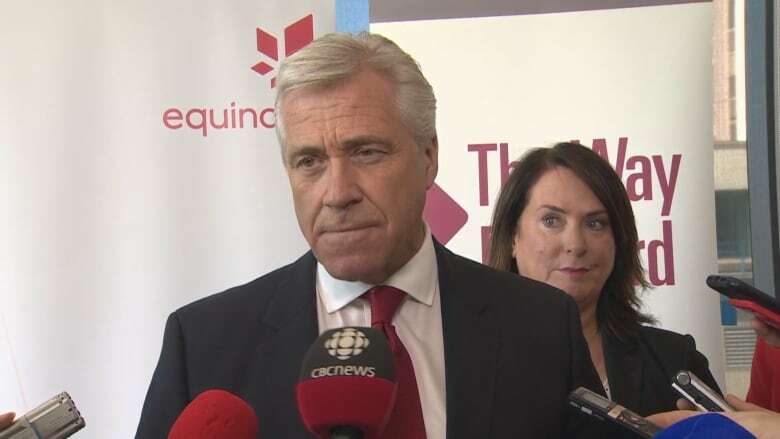 "Today marks the global recognition of Newfoundland and Labrador as a preferred location for deepwater production," said Premier Dwight Ball Thursday morning. "Equinor and Husky's commitment and investment in this project highlights the attractiveness of our industry and the potential that exists within this province in our offshore." Does the Flemish Pass hold the future of offshore oil? Discovered in 2013, the Bay du Nord project is expected to be sanctioned in 2020 — with first oil in 2025 — and is projected to hold oil reserves of nearly 300 million barrels. Government estimates the break-even point for the project is $49 (U.S.) a barrel. Brent crude is selling for about $75 (U.S.) a barrel today. It's expected that the operations phase will create 500 jobs, and generate the equivalent of 22.3 million person-hours of work during construction and its operational life. Ninety per cent of the project and procurement management will happen in the province with 51 per cent of pre-development and development engineering also taking place here. Ball says the new oil project will bring new employment opportunities to the province over its life and bring economic activity to the province's doorstep. "With today's announcement, we take our first step into the new frontier, we mark a new era of deep-water exploration as well as the opening of a new basin — the Flemish Pass. The future of our offshore begins today," he said. Ball said borrowing to cover the costs is just part of major projects like this one and $90 million is required immediately to cover existing costs, and an additional $680 million for construction costs. "We are borrowing for many things now as you know. But when you get the opportunity to make an investment, no different than any business, it really starts out with borrowing in small amounts and you look for the rate of return," he told reporters. "And the rate of return on this $90 million for us as a province will bring significant and tremendous benefits to the people of our province." Ball was joined by Natural Resources Minister Siobhan Coady and Unni Fjaer, a vice-president with Equinor Canada — previously known as Statoil. Currently, all of the province's oil projects are located in the Jeanne d'Arc Basin. This agreement expands that to a second area, the Flemish Pass Basin. This particular site is located 500 kilometres off the coast of St. John's and at an approximate depth of 1,200 metres. To put that in perspective, the SeaRose platform drills at a depth of 120 metres and is Newfoundland and Labrador's deepest producing oil field today. With a new oil project comes new challenges, but Fjaer assures everything is business as usual for Equinor. "We have deeper projects in Norway, but this is technology that Statoil has developed through many years of operation," she said. "So deepwater is nothing new anymore for (us).… This is really a very important milestone for us as a company and it gives us the possibility to work further with the project now in order to succeed." The Flemish Pass project is the first one to be negotiated under the province's generic oil royalty regulations, said the government in a media release.